It does not matter if the vendor is big or small, local or global, domain centric or broad based, custom solutions developer or provides package implementation services, hardware products or software licences, or any kind of service provider; they all want you to believe that they all are worthy of being anointed as a preferred and trusted partner to your IT and business initiatives. Everyone without exception believes that they imbibe behaviours that qualify them for this elevated position. Today we have partners providing total outsourcing, specialized domain specific or business process outsourcing, desk side support, apart from the various categories listed above. Many of these who have put in their heart and blood into delivering products/services irrespective of the contract or commercial arrangement are truly partners to a CIO and the enterprise; my respects to them. We also have partners providing toner cartridges, USB sticks, printing paper where price is typically the determinant factor ! What appeared to be a dream run became a moon race with surprises all through the journey ! The initial effort estimates did not fit the project reality; either the team who did the initial study did not understand the complexity and expectations or her inputs were ignored in the proposal. So there was an attempt to restrict scope to fit the resources allotted. That upset everyone involved; the CEO made a visit, so did others involved in the initial discussion. Much water had flowed and a dam was essential. Restoring some sanity to the project with the vendor CEO approving the additional investment and some hit on the CIOs side too, the project looked like being back on track; but that was a false positive. The lack of trust made success elusive; the potential partnership gained adversarial tones with each pinning the blame on the other. It took some effort to bring everyone to a common understanding and move ahead. People with goals succeed because they know where they are going. This has never been so true in the current economic uncertainty; companies struggling for growth put their employees in peculiar situations. They are expected to deliver monthly and quarterly targets whereas the discussions are expected to be strategic and long term. This is challenging for the CIO and the IT team where typically projects do last beyond a quarter (with agile exceptions) and investments require a 3-5 year horizon. When I met with the management team of a large enterprise vendor selling applications and technology solutions, there was a paradoxical discussion on my long-term needs and their short-term requirements. They wanted me to present the Business and IT roadmap for the next 3 years and initiatives where technology was a critical component, which I did leading to discussions on technologies and partner solutions that would become projects in the future. They had their team and many partners listen in. The sales team and some of the leaders from partner companies wanted to know who they should connect with in my team and when they can come over for a detailed discussion. They came in different avatars, confident, cocky, arrogant, tentative, all types made up the discussions on the possibilities. I intuitively liked some, was intrigued by a few and did not see value in the rest keeping in mind my priorities. Their interest was to strike at the opportunity and if they can meet their monthly or quarterly targets. I don’t mind helping when I can, however the gap between the talk and the walk was evident. How can a discussion at two different planes be aligned and create value ? My timeline was not aligned to their urgency to sell. So I advised them which some took in the right spirit while a few found it difficult to accept that I did not want their solution/technology. They espoused the efficiency, potential saving, the best in class nature of their wares showing incredulous surprise that I was rejecting their pitch. How do we align expectations that all stakeholders have the same shared vision of the future and the direction being taken ? What should CIOs do to set the groundwork ? It is a difficult discussion in many cases with hierarchical selling that puts pressure on the CIO while s/he has to balance the set of internal priorities and needs. Balancing tactical with the strategic is a fine skill that very few are adept at. To have a bird’s eye view with ability to pick the target like an eagle separates the good from the best. I have found that in most cases plain speak is the best option; be upfront with what are your priorities, what you need, how you will evaluate the options across different vendors; essentially what is the decision making criteria and the timeline, who will be involved etc. you get the point. Most vendors find this transparency a great starting point and they are willing to work with you. There will be exceptions when they try despite the open communication; they need to be managed with a firm hand. So coming back to the discussion that transpired; it took some effort to not get upset with the blatant disregard for the stated intent and objectives. I could finally prevail upon the recalcitrant vendors to align to my priorities and reality. Over a drink later in the evening there was camaraderie between us and everyone acknowledged the candidness though they had found it difficult. Does it mean that CIOs do not always do this or vendors need to learn how to listen better ? Year after year enterprises engage in an exercise that is like a well-orchestrated dance of corporate executives, each playing their best role and they have to collectively also look good to the audience. Interestingly the audience is the executives themselves, the Orchestra Master (CEO) and Board of Directors who asks for changes to the story line or approves the end result. At a broader level successful execution played to the stock market and analysts acknowledges work well done. Like in an orchestra an ill tuned instrument can strike a discordant note, the collective sum of efforts needs complete alignment for an enterprise to work at as close as possible to its optimal level. This applies to the planning process as much as to the execution. Undercurrents during the planning process if ignored will come back to haunt the team during execution. All this is common sense, nothing new here, but we still continue to self-impose challenges and then find complicated solutions. Every year give or take a few weeks this is the time when for most companies budgets are approved for the next year. The process begins many months earlier and after multiple rounds of discussions and negotiations, the final budget is presented by either the entire management team or select few (read CEO, CFO and maybe the CMO) to the Board. As boards have to “add value” they challenge the collective wisdom and either inflate the top-line or bottom-line or both or cut costs leaving the team perplexed or so it seems. We all learn the game fast and keep buffers in the budgets for such eventualities. We offer the token protest and accept the fait accompli moving on with life. It is funny that this repeats itself in every department, company and everyone goes through the charade almost unthinkingly. The process leading into the D-day and thereafter is notable. But there are many who are challenged; let me reveal a few scenarios based on some direct, incidental and anecdotal data. Budget planning is typically a function of planned capital investments and operating expenses. Most companies are CAPEX unfriendly and there is always pressure to reduce operating expense. For the CIO the two edged sword draws blood by moving hardware and licensing to operating expense and then the CFO wants to cut OPEX. Finance and/or business friendly CIOs know how to manage this, others struggle to keep their head above water until one of the powerful CXOs throws them a lifeline. Post “rationalization” by the Board, the situation gets even more interesting. Now that everyone has been given a say 15% operating budget cut, the un-buffered and bewildered CIO struggles to stay afloat. A frustrated CIO once commented, where do I cut without impacting service levels ? I cannot go short on licenses, nor on bandwidth, and service providers want inflationary increase, AMC needs to be paid, travel and training are already down; do I go to the CEO, or CFO, or better the Board with a begging bowl ? In jest or otherwise the remark portrays the helplessness felt by many and not just the CIO. Is there a way out ? There is if everyone went back to basics and stopped predicting the future based on the past and making unrealistic projections on what the business will be next year. It would help if all functions worked the budget together acknowledging dependencies for success rather than in silos. It is then up to the CEO to play the galleries or stand firm ground with the Board when s/he represents the team’s collective effort. Where would you draw a line as the CIO/CEO ? Will you accept the cuts ? How will you ensure that realistically the company has enough cushion to react to market and competitive moves or the black swans that seem to be common now ? Will you put your neck out for the team ? I have always gone into a meeting with the maxim that budget is an intent to spend; we collectively determine the spend and own it up irrespective of which head or bucket it sits in. There are limits to cutting cost, let’s focus on the customer and how we can increase revenue. That is a better discussion ! I had heard this term a long time back and then forgot about it; in those days my team was small and activity largely technical. I wore professional pride on my sleeve proclaiming that I could solve any technical problem, well almost any problem within the many technology domains that I specialized in. So whenever the team threw a crooked one at me, I would get my hands dirty and triumphantly bring out the solution. Many CIOs would refer to that era as the good old days, in reflection I wonder. As teams got bigger and the focus shifted towards learning the business ropes across functions, the technology prowess diminished and I started farming the problems to either my team mates who were passionate about technology or vendors who were always happy to help; however partaking in their success still gave me highs. Time pressures ensured that these moments became far and fewer until I realized how easily I was goaded into taking on a challenge to find a solution, faster, cheaper, better ! I became wary of opening conversation lines, “we have a problem …” We ? But you just walked into my cubicle/cabin and we still have not exchanged pleasantries, so where did I fit into the equation ? You have a problem and you want my help in solving it would probably describe the situation aptly. You believe that my superior knowledge or problem solving ability or network of contacts could help resolve the sticky situation in which you find yourself. Such conversations were not always pleasant; my ego however needed the massaging. And then about a decade back or so it hit me that I was the perfect dummy being subject to upward delegation. My entertaining the protagonists gave them an opportunity with a few words to transfer the responsibility squarely onto my shoulders. With me telling them that I will get back to them, they did not have to work upon it. If deadlines were missed, it was my problem; if the problem was escalated, it was back to my table where the buck lay and I had no way of passing it back to the originator. Reading through Ken Blanchard’s “One minute manager meets the monkey” had my life run before my eyes. That and learning from another management guru gave me the mantra that finally extracted me out of the self-created abyss. I tried practicing the techniques I had learnt from these wonderful texts and guess what ? They worked very well indeed. They have now become a part of my working style and I guess that will continue to keep monkeys at bay. It would appear simplistic if I said that the dialogue now starts with “You have a problem … and what do you propose as a solution ? If you are at a dead end, here are the resources that should help you find solutions. Come back within the agreed timeline and we can discuss your recommendations on how to solve the problem”. I am not oversimplifying the issue, this works almost all the time; yes there are exceptions or tricky ones which need a different and more direct approach. “It does not require two (or more if the issue is brought by a team) of us to solve a problem or get something done. Either you (find a way to) do it or give up the task and let me find someone more qualified to get the work done. I have not had anyone take up the latter offer as yet. They typically do find a way to solve the problem. It is not necessarily incompetence that gets them to this situation, occasionally it is laziness and many times their risk-averse nature (fear of failure or ridicule). Upward delegation is easy for everyone when their manager/function head lives in professional pride and arrogance. The true CIO leaders would do well to abstain and learn the art of monkey management. Be aware and careful in your retaining the problem with you, lest it consume you and a large portion of your time. Even if it gave you a kick or a high, it would be a very expensive way to solve something trivial for the company. The number of people who associated with the behaviours I wrote about in StopSelling part 2 brought home the realisation that the nemesis is a lot more widespread than I thought. Even more interesting part is the longevity of the issue; few readers reminisced their younger days ranging from a few years to a few decades when they behaved like that. It would appear that learning on selling IT has not evolved in the last few decades while the roles of the buyers have. Every encounter in recent times across multiple vendors selling diverse range of products and services demonstrates consistency. In a competitive industry where decisions are not just based on price but also on quality of service or product, the difficulty faced by the decision makers and the CIO is to give a clear and unambiguous decision. Vendors need to learn to accept clear communication and respect the decisions conveyed to them. Eons back having spent some time in sales, I know it is difficult to accept a loss of sale. When you have spent a long time in the decision making role, relationships between CIOs and Tech Company CEOs are formed. These are leveraged on both sides in difficult times and also to pitch for a good deal or going beyond the contractual obligations. The alignment of objectives creates win-win situations and builds healthy respect between individuals and companies. Conflict arises when multiple relationships vie for the same business and their attempt to leverage this with the team and the CIO. In Business-to-business engagements, hierarchical selling is practiced by every company. Engagements start with Account Managers talking to IT teams defining the solution, the discussion progresses to involve layers upward until the CIO and someone senior (VP, SVP, BU Head, CEO) agree and sign off endorsing the deal. Companies that do not get the deal make desperate and largely futile attempts to influence the outcome. I am not against this, however when a company overdoes it not willing to accept the verdict, they get the CIO’s irritation and look like bad losers. More than 5 years back a company had me talk to their sales team on “What CIOs want” or “Selling to the CIO”. I repeated this discussion with many large and small companies over the years with good results acknowledged by the attendees. Recently I had multiple meetings with leaders from the same company who could not accept that the decision had gone in favour of a competitor. Somewhere along the way with attrition the learning withered away. Or is it pressure of difficult times ? I believe that for things to change collectively we all have to work together; the CIO will have to be consistent in the way they give the message of success or lack of it. Transparency in evaluation, engagement and stating decision making criteria upfront will create a better platform for everyone. Complementing this, the vendors need to not rue over one transaction that did not go their way and work towards bouncing back such that relationships do not feel the strain. Let me share an anecdote: An Account Manager desirous of his CEO meet the CIO tries to schedule a meeting based on his CEO’s calendar. Attempting to influence the CIO’s Assistant he brushes aside protests on the CIOs unavailability on the proposed time. He pushes her to reschedule other appointments to accommodate his CEO. When that does not work, he calls the CIO to meet the CEO while the CIO is in the general area where the vendor office is located. Even when the CIO declines, he insists and goes ahead. When the CIO does not turn up, he chides the CIO to say he cut a sorry figure with his CEO. No guesses on where this relationship will end up ! Chief Insecure Officer ? You must be joking ! Research Analysts from the industry keep finding excuses to put the CIO down; I have no idea which set of CIOs are on their panel or the ones they interview or poll for various reports that they publish. The data is not available to the audience who may want to challenge the conclusions. These reports almost always end up portraying the CIO in negative light. The effect that these “respected” industry analysts have on me is similar to the red flag in front of a bull and I end up taking the bait almost every time. The CIOs role is going to disappear; the CIO now has to depend on the CFO for approval of every spend or investment; the CMO is taking away a significant part of the IT budget; the future of the CIO is uncertain; the CIO has not evolved to becoming a business leader; the CIO cannot become the CEO; the CIO rarely gets a place on the management table; the CIO is being relegated to the back office; the CIO needs to give up being a hardware hugging IT manager. You get the point, I got high blood pressure ! In a recent conversation with one such analyst, he joked with the gathered CIOs that they seem to be getting themselves a new meaning to the acronym; he started describing his recent encounter where the CIOs were mortally afraid of letting go their infrastructure (hardware hugging CIOs to use his words). Maybe he made it up, maybe it was true, we couldn’t fathom, a few CIOs surrounding him were red and pink, waiting for someone to challenge him. Questioning did not reveal their location, industry or size of company. Rechristening the CIO as Chief Insecure Officer, he stated that the CIO in the changing environment should be worried about his/her existence in the future. With the cloud becoming pervasive, the purchase power stands diminished; the licensing is being discussed with business teams he postulated. The CIO has to keep things running he concluded. My reality being different also echoed by most that I know, there was a clear disconnect to his qualified remarks. What causes this situation ? I believe that it is due to the fact that many CIOs are unable to discuss specifics of the initiatives they are driving for confidentiality reasons. That would be giving away the strategies driving business or profitability growth which would be counterproductive with competitive advantage being lost. It is also that most companies have stringent norms on who speaks to press and the level of disclosure allowed. Whatever the reason the analysts infer what is convenient for them and what makes headlines. Is it time to unshackle the CIO to provide a better understanding of their contributions and their leadership ? The marquee CIOs have been empowered by their enterprises and they are making headlines with case studies and speaking in various forums. That does not necessarily imply that the rest are not contributing albeit silently. Either way it is time to stand up and not be cowered by the statistical data thrown at us by the industry analysts. There may be regional and industry imposed differences across geographies on the role of the CIO; those pale on the face of the fact that almost every company today draws its operational and strategic advantage on the foundation of IT. The critics will attempt to undermine the borderline cases and sometimes also cast aspersions on the better ones; the CIO has a choice to take them as distractions or be influenced by them. Go ahead and make your choices and carry on the great work that only you can. P.S. I just received the E&Y DNA of the CIO report, and that is another story for another time. Keep watching ! Happy Diwali to everyone ! Jalebi is an Indian sweet (also eaten as dessert) extremely popular in the northern part of the country though now available internationally in Indian restaurants. 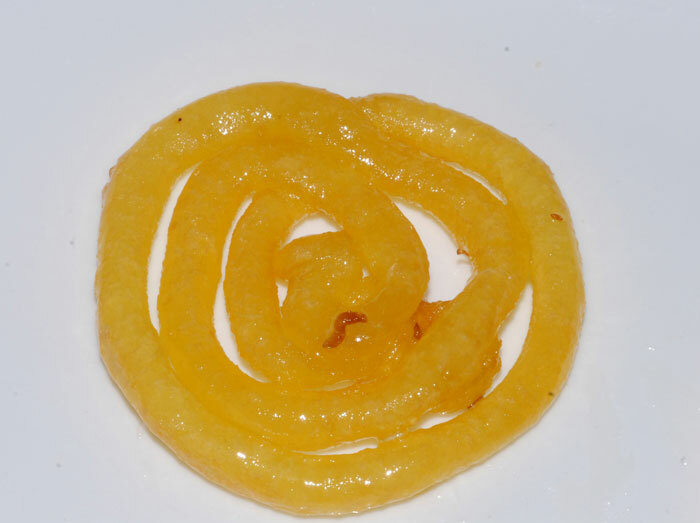 It has a complex circular structure; the photo is one such representation of what a Jalebi can look like. In recent times, Jalebi was made famous by a Bollywood actress with the character named Jalebi bai. I have always been fond of Jalebi though in recent times have reduced my indulgence. The internal customers were already sold on the device not the solution despite its shortcomings for the specific business need which required significant internal change. The business head had been aligned to the device (not the solution) and the meeting was expected to be a cakewalk. Despite the iconic nature of the device, the technical team was wary going into the meeting; not many enterprises had deployed on the scale that was envisaged and in challenging environmental conditions. The meeting started well with a summary of the proposed solution, similar deployment in developed markets though on a smaller scale and how they can change the way business is done. The technical lead started asking a few questions which they tried to brush aside. He persisted as the support burden would fall upon him and he had to be sure. With amazing clarity of thought he laid down the questions that would determine the fate of the project in the long-term. The vendor sales head started to justify the value proposition by talking about how the device has gained popularity globally and caught the imagination of the consumer. Their dominant market share is a validation of how well their device works. The number of solutions available on the device outnumbers all other competitors put together. They have been continuously innovating on making a better device. He went on and on, on the merits of the hardware sidestepping the pointed questions. The discussion was going nowhere so the CIO intervened and sought specific answers to the specific questions. He clarified that the decision was contingent on the ability of the overall solution including the device to work as expected. If there are no workarounds or ready solutions, then they will have to explore alternatives. The long stories cut no ice, come straight to the point and stop going round in circles. After moments of silence, the meeting proceeded to its logical conclusion quickly. In the post meeting debrief, many in the room almost in unison associated the past hour spent to the vendor making Jalebi. He avoided giving straight answers to most questions instead preferring to remain vague in his responses. Any love for the vendor by association to the device soon evaporated leaving everyone impatient to get over with the charade. Business does not and cannot accept the nebulous and imprecise when working to solve a determinate problem. With tolerance levels reducing and options increasing to solve real business problems, vendors have their task cut out for them; the business and the IT teams are working collaboratively to arrive at solutions. The discussion is focused on what matters, the scenario is the same internally too; no more beating around the bush or running around trees. The Jalebi is great to eat not considering the calories it adds; go on a diet, keep it away from the meeting room. The solution expert across the table looked crestfallen; his manager besides him attempted to calm his frayed nerves while the account manager to his right did not know where to look. The CIO had advised them that the solution was not relevant to his future needs and the discussion was over. Breaking the uncomfortable silence, the manager sought to find a silver lining in the cloud, a sliver of hope that there may be a faint opportunity in the future ? Firmly declined the CIO; then things started going out of hand! The starting point of the meeting was the aspiration of the incumbent solution provider to retain the customer who had decided to move to a competing solution. Over the years that the company had been using the solution, the relationship was managed by vendors’ partners with the principle staying hands off. Challenges with the implementation and support were largely managed by the partner. As the company started feeling the pinch of a suboptimal deployment and support, they sought alternatives. The alternative solution was not really an alternative but an industry leader with now a dominant local and global market share. After multiple futile attempts to reach across the teams of the incumbent provider, the CIO gave up and started working with layers of his enterprise to gain their support for a disruptive transformation and go with the market leading solution. As the news reached the incumbent, their leaders started arriving in droves to rescue the situation; this was one such meeting. Unwilling to accepting “No” to his plea the expert started challenging the decision making criterions’ stating his solution was as good if not better than the competing product which had a higher TCO (Total Cost of Ownership). While the number of customers today may be lower, the new upcoming product would compete head on. All other things being equal, why did the CIO not get this ? Why was he insistent on going with the other expensive solution with significantly higher license and implementation costs ? The exasperated CIO raised his voice a notch and stated that ROI and TCO were not the primary factors for the decision; the company had lost faith in the incumbent solution and the vendors’ ability to support the new business requirements. The company needed a better and globally accepted solution. Their solution has not found favour within the industry after so many years and neither has the vendor engaged with the company in a way that induces confidence; so no point continuing the discussion. Desperation defying logic, the red in the face expert could not face the ignominy and wanted to know what he or his company could do to retain the business. How can he prevent the entry of the competing product and solution ? He was now clutching invisible straws. The account manager wished the earth would swallow him, while the boss-man tried to pacify the agitated expert. The amused CIO simply said “I don’t have to answer your questions; this meeting is over” and walked out of the room. Selling is an art as much as a science. Peter Drucker postulated “A customer never buys what we sell”. The transaction completes when the need to sell is aligned to a need to buy. In the absence of a balanced equation, the relationship sits on a weak foundation; then the possibility of successful execution is reduced leaving everyone vulnerable. Unfortunately an open dialogue is rarely understood or appreciated today in our target pressures driven by monthly, quarterly or annual budgets. I believe that vendors should learn to accept “No” as much as they like to hear good news. Every time every one cannot get a favourable deal; someone will be deprived of success. Don’t push beyond the break point lest you end up compromising relationships. The CIO too should not be swayed by these tactics, pressure from other CXOs, or end-of-season sale kind of deals. The relationship is based on demand and supply as much as on trust and respect. Any change in the equation will have an impact. In the last few weeks there has been a lot of publicity and visibility on the fact that CIOs are being or going to be measured on business metrics, many of which they do not control or influence directly or indirectly. This sparked many a debates on various forums that attract CIOs, social media sites and groups that are dedicated to IT leaders. Not that anyone tried to contain it, the fever spread globally very quickly with reactions that spanned the spectrum of emotions. Traditionally IT was measured on three aspects; operational efficiency, budgets, and delivery of projects. The connected world also added information security. Disaster recovery and business continuity surfaced and made it to the dashboard. Somewhere business benefit crept in and then projects were also reviewed from a business angle. Regulatory compliance required significant IT support and thus edged in. But revenue, profitability, customer acquisition or retention, product availability ? How does the CIO influence any of these ? Can better IT deliver additional growth ? Will technology drive profitability ? What can the CIO do to acquire new customers or retain existing ones ? And what about product quality or availability ? If cash flow is an issue, how will systems ease it ? Competition has a better and cheaper product or a great marketing strategy, can IT or the CIO counter it in any way ? If the answer to one or more is no, then why link performance or compensation to these measurements ? It is evident that this piece of news has many people worried, and not all of them are CIOs; they are propagating the message that if I cannot control something, I should have the choice to determine if my performance is likely to be impacted. Fair point if the organization worked in perfect silos. In business and life uncertainty is certain and thus even the metrics that seem to be under control have dependencies – internal and external – which are beyond one’s power of influence. Does the CEO control how the industry will behave ? Can the CFO control interest rates or liquidity crunch ? If the customer does not buy, what can the CMO do ? Rhetorical questions ? They are not helpless, but there is a limit to their ability to influence the outcome. They do play a role and they depend on the rest of the CXOs to work lock-step in achieving success. CPO (Chief People Officer) has to help hire and retain the best talent, CIO has to ensure information availability to key stakeholders for decision making and analysis. That’s what the C-suite is all about. So if the CIO stakes claim to the table, it comes with a set of obligations and responsibilities; it comes with the territory; all CXOs are jointly and individually responsible for the success of the enterprise. It is not about “I have done my part and now you go figure”; I believe that CIOs should and does actively seek this responsibility and then works with others in shaping the future. The C-suite has to take this variability risk. Only then can the CIO aspire to take a position on the Board or become a CEO. CIOs are a lucky bunch, whenever they have a problem of any kind, all types of help is available to them from various sources; IT vendors, system integrators, business school professors, peer CIOs, and finally management or IT consultants big, small, and even individuals, ex-CIOs i.e. retired or in-between jobs. All of them bring different kind of experiences and solutions to the table; some with a genuine interest to help find the best solution, others with a vested interest to sell goods or services. Recently when I moved to a new industry and assignment, there was a flood of offers to help from the entire gamut of consultants. Can we help you understand your new industry ? Would you like us to do a diagnostic of the current situation ? What about some help with IT strategy ? Can we offer you some interesting research papers on the industry and its challenges ? How are you planning to prioritize the various business pulls and pressures ? Is there an IT governance issue you want to address ? …. Their insistence, persistence and perseverance created a few moments of shaken confidence ! Did I really need their help to get started ? I asked them for data on similar engagements where they had contributed to the direction and shaped the future for the CIO. My mailbox almost ran out of space ! There were local and global case studies, customer references, engagement frameworks and best practices. I was surprised with some names of good CIOs friends, while others were predictable. More than a decade ago as a newbie CIO I had gained some benefit from the consultants and IT advisory and research companies; they helped fast track my learning. But these references were amongst the best of CIOs. So I decided to call them to find out why they engaged these consultants; what prompted them to spend, and on what did they invest ? Did they get any insights that eluded them or create a better strategy or help them in their success ? Should I too get some of them on board ? The answers should not have surprised me but they did; the consultant brought credibility to the plan, documents on current status benchmarked to local and global metrics. The big name consultants were seen as the best options even when they put your words and common sense into fat documents and fancy presentations. Somehow the stamp of authority and approval made the difference to company management with higher acceptance. The CIO had validation of his/her choices and rub-off credibility from such engagements. Now I am not averse to using consultants or industry experts in areas that need a different level of thinking and problem solving. To drive company-wide change across different stakeholders can always do with some help ! I have had my share of good and mediocre; authority is not bestowed by the brand or the years, it comes from a deeper understanding of the issues and positive query; whereas the ridiculous ones tested endurance levels not to be recalled again. In my current context I felt that whatever the consultants wanted to solve is what the company had hired me to do; that was my core competency and what I excelled in. By the time they came to the table I had most of the answers that had been discussed and accepted as the reality and way forward. I tested my hypotheses with a couple of big names; they acknowledged that I was on the right track. Did I need a validation of my decisions ? I don’t think so and neither did the rest of the business leaders who found the rationale and direction to be credible in its articulation. I believe that the use of consultants is finally a matter of personal choice influenced by the organization culture and the locus standi of the CIO. The past record of success internally or with consultants determines what works better. I think for now I will continue to stay away from them. My friendly Board Member who has also been my mentor for some time now always brings up very interesting points in discussions. I have always enjoyed talking to him as he challenges conventional wisdom with his way outside the box ideas. Being technology savvy, discussions with him tend to be not just at a high level but at times I have to explain why one solution scores over the other. In one such meeting he brought into the open a dimension. We were discussing a new Predictive Analytics solution and its adoption in the industry not just locally but globally. With no competitor locally using such a solution, with bright eyes he started drawing the end game that he wanted us to reach; the dimensions were simple in their representation but complex to execute requiring multiple data sources and algorithms that would challenge most. As the big picture unfolded, it had me and the team scared and excited about the leap forward for our company. Using a formal matrix for evaluation of the solution is normal for IT; functionality, roadmap, customer success, ease of use, scalability, investment, and industry fit are some of the parameters. He helped us refine the list discarding most of them considering every solution scored a tick on them. It then came down to a few that focused on strategic intent and investments by the vendor. E.g. How many customers has the vendor invested in to enable them to succeed ? Success and failure rates of IT lead projects have been a statistics that scares every one; the reasons have not changed much over the years since I read about them first more than 15 years back. So there was some hope with a project endorsed by Board Member, but then the big question was if we can sustain his interest over the 18-24 month period in which the end outcome would be measured. We decided to raise these questions to moderate expectations and ended up inviting trouble. Why are you all so risk averse ? How would innovation happen if everyone wanted a fool-proof solution that someone has used in the past ? Why are you always looking for precedence ? Early adopters always gain a competitive advantage even if it is short-lived; in most cases the followers get lesser benefits. If you keep working with a view that we don’t want to get anything wrong, is there a guarantee that you will not ? And not getting it wrong does not imply that you will get it right ! Doing nothing wrong would mean that status quo is the best place to be; trying something new is always fraught with risk. I am not implying that we take undue risks on new untested technology solutions. To get something right requires collective buy-in that CIOs seek for most projects; the marquee CIOs take a lot of calculated risks, and yes they do face failed projects more often than others. However they more than make up for them with their successes. Inertia is not a good keyword for IT and CIOs; they should seek unexplored avenues to make a difference. I believe that we all strive for success and in the same vein we have a phobia for failure. The obsession to always succeed may result in a dull and boring existence that is disconnected from real life and business which has to compete every day in a new competitive environment with uncertainty. I tend to agree that doing nothing wrong does not mean that you are getting it right ! The front page of a business newspaper carried an interview of some of the big 5 IT services company CEOs that had me engrossed as these industry captains shape the direction for the industry, influence decision making and are consulted by global CEOs on IT strategy and direction. Thus the interest was high to gain from the collective wisdom as they talked about their experiences with global CIOs, decision making process, budgets, successes and finally their perceptions of where CIOs could and should be. There were some clear messages; the global economy will continue to remain under pressure for the next couple of years. Outsourcing deals will be smaller and of shorter duration as IT budgets will see a lot more rigor in the discussion. Talent shortage will squeeze growth for IT companies and Cloud computing will keep the hardware industry challenged. The CIO role will change again with technology evolution; the difference between the good and the challenged CIO will widen. They outlined the differences on how CIOs across geographies and industries outsourced core and non-core activities to focus on what matters, i.e. you guessed it right, the business. But then they also mention in the same breath that CIOs that did not outsource remained challenged to align the IT objectives to business. Whether it is Remote Infrastructure Management, or Application maintenance and everything in between, the message was clear, outsource or perish, get relegated to reporting to the CFO. Huh ? Now that is simplistically stretching a facet of the CIOs role to create a perception that outsourcing can be equated with strategic intent. If you don’t outsource, then you and your team is busy with things that do not matter to the business and thus you are likely to remain alienated. Was there a vested interest in the words from these CEOs who have been struggling to grow their business ? Some had taken over from ousted CEOs with a clear mandate to bring back the old days of high growth. While I am a proponent of outsourcing and have partnered with IT service companies big and small to give away the technical or operational activities, in my experience there have also been cases of outsourcing not delivering to promise. CIOs connected with the pulse of the business draw the line on what needs to be given away and what should be retained. The company’s focus, perceptions of core, and finally the financial health determine what operating model should be adopted by the CIO. The CEOs went on to talk about CIOs need to engage their stakeholders on what matters. People in a glasshouse do not throw stones at others. My plea to the same CEOs is to introspect a bit before preaching to their customers, the CIOs. The sales heads of the same companies want to engage with the CIO on nitty-gritties of technology that even the next level in the IT department rarely gets involved in (OMG I saw a data center). They do not practice what they preach. A few CIOs I met the next day agree ! So what separates the good from the challenged ? I do not for a moment believe that it is as simple as outsourcing operations or infrastructure or total outsourcing; a good CIO is a well-rounded leader who manages people and perceptions while ensuring that the delivery of promise is consistent with quality that is visible. S/he communicates effectively in all situations and is able to challenge business and IT partners/vendors in a discussion on the right solutions to business problems enabled by technology. Is this the finite list ? No again, there is no checklist that determines the difference; you have to find your balance. Recent times have seen some distinguished CEOs and leaders biting the dust literally when some untruths were discovered in their resumes, a clear case of unnecessary padding. A few did not possess the qualifications they professed, some had not been to colleges they put in there. These are not run of the mill average Joe kind of people, they are in high offices and have shaped the future of many. It created news for a short while, and then everyone moved on relegating the tainted ones to oblivion. To expand the team I recently started hiring fresh and experienced talent and was flooded with resumes. It was a task to navigate through pages of hundreds of eager professionals looking through spell check errors, acronyms that I have no clue what they mean, grammatical goof ups, and multiple formats that challenged me to find information in a maze game. These were not freshers, unexposed to corporate culture; they included experienced professionals with decade plus behind them. I did not challenge the veracity of the information presented even in cases that stretched conventional wisdom, though annotating to explore further in the interview. I discovered that IT folks are largely truthful and sometimes too much; if they have been on a project that involved a leading edge technology, they will ensure it catches your attention. Only on digging deeper you realize that their role could have been just testing or documentation; or maybe peripheral and not technical or functional. The conscientious mentioned every project, every assignment, and every new company even if they spent only a few months in each; though the interesting ones were the gaps which during the interview were explained in shy and embarrassing tones. They believed that if you join a company and realize that it was a mistake, don’t mention it; skip the experience that does not reflect well on your resume. No mal intent here, just that not always in interest of keeping an abridged and concise representation; just to put the best foot forward. So how to get the real person out of a few pages of history including education, experience, achievements, personality, potential, technical skills, and what have you. There are umpteen reference websites that offer to teach the art of interviewing and getting the best out of the person sitting across the table, the potential candidate. The intent though not adversarial is to assess everything possible about the person in the typical less than an hour spent, lateral thinking and what not. I am not sure if this would make sense, but it is not just the responses to the questions that help us in the selection process, there is a lot more. The first few minutes have already decided the way the interview goes; subconscious mind or body language, you already know if you will like the person. The resume and the detailed planning are then thus pointers to the discussion. I have rarely seen a situation where the candidate was able to swing it around though many did not live up to initial expectations. Coming back to the moot point, why do people manipulate resumes ? Is it just to look better than who they are or a desperate urge to get something that is not rightfully theirs ? Is it misplaced self-esteem or belief of personal value ? I don’t know, everyone probably has different motivations; do they realize that in the end they are really undermining their integrity and the way people see them ? Or has the value system changed in a way that we are comfortable with little lies if they go unnoticed ? In the monsoon season, clouds are a good subject to discuss. The last event I attended headlined clouds of all types; public, private, hybrid, that had everyone exchanging notes on experiences in drought and rain. Participants from public sector and government agencies, companies big and small, service providers and a few academics, all found something to talk about and share. The organizers were beaming and so were the participants; networking at its best which most events promise. There were a few small groups that decided not to move out of the conference hall during the breaks finding comfort in each other’s company. It was evident that they were not at ease in reaching out to strangers and discussing subjects of mutual interest. Our IT teams have many such people who lack the social niceties and behaviours that are normal in say the marketing team. Such individuals are present on social networking sites albeit as silent observers rarely posting or sharing anything at all. Over so many years I have wrenched such individuals from my teams from their machines and pushed them into the big bad world of people who are unpredictable, emotional, talkative, demanding, lively, aggressive, and overall human in their demeanour. The abovementioned IT folks cringe at the thought, but slowly and steadily open up and realize that it is not so bad after all. Most are able to transition over the boundary into the normal, the rare few who do not constitute groups like the one I saw. In a hypercompetitive world that demands higher performance every day to stay in the same place, the balance between soft skills and domain (or technical) expertise is important. Everyone talks about the traits CIOs need to embrace; the teams are left to fend for themselves and in most cases at the mercy of the individual CIO to elevate the level at which the IT team operates. Successful CIOs who nurture talent and high potential performers invest in their teams giving them the platform and reason to grow. So what has all this got to do with MPLS networks ? By definition MPLS networks were defined to create efficiency over existing networks in the mid-90s. With evolution they became the preferred option for many. Network administrators loved them for reliability and performance; they hated the opacity by virtue of the cloud architecture. It was big evolution for many and most techies adapted well. This is evident from the fact that most enterprises embrace MPLS over other network types. In the real world of people, recent times have seen disruptive changes due to social networks. It has had the world excited, the marketing teams worried, and everyone wondering on whether there is a ROI in social network. Consultants have thrived and definitely made some money. It cannot be denied that Most People Love Social Networks. They provide freedom of expression in a level world. IT organizations clamped down with security concerns. Now, social media policies have replaced dictatorial censorship. Some mature companies have seen their CIOs take lead in this arena and drive social media strategy successfully and a few also found a way to make money. These CIOs and IT teams belonged to the MPLS network groups, did not talk about old paradigms like BITA, had higher success in customer engagement and continue to be the envy of the world at large. I believe that MPLS is the way forward for everyone. IT has to lead from the front and not follow in the back. Where are you today ? Part of the MPLS gang ? Talking to a few CIO friends on the much debated and discussed subject of “what next” for us the CIOs, many aspired to be CEOs. Now that is a good thing given that CIOs are setting their goals high; some are also achieving it within IT companies, a few in other industries too. Making the transition was possible for them as they graduated from technology enabling to business enabling to business itself. Their leadership was acknowledged and when the opportunity arose, they were considered rightful choice. Trust and respect from peers is garnered step by step everyday with the word and the deed. Conviction that comes out of past experience, the ability to consistently deliver against odds, the cohesion of the team in committing to the stretch and unreasonable, the ability to engage in conflict resolution focusing on the issue and not the people involved. They are always happy to help, sometimes even with personal sacrifice. This separates chalk from cheese. You would say that this is just a sample of everyday behaviours that make a successful leader and CIO; it is also shaken quickly with hearsay and frequent missed steps. Respect is always earned, rarely conferred if at all; it comes out of consistency in delivery, walk the talk, articulation, coaching and mentoring others selflessly. The mojo develops with practice and stays with them as long as they continue to stay grounded through the journey. Nothing new here too ? Hold on a bit. The gap between perception and reality is based on the demand supply management between IT and business. When CIOs manage this well, they remain relevant to themselves, the business and the enterprise. The progression is determined by the interventions outside of their realm and “out of comfort zone” discussions. The CXO has no boundary defining Job Description; they only have a primary allegiance to a function. So when a successful CIO asked me the path to becoming a CEO, I wondered what qualifies me to give advice ? While I am a CIO and have held a few P&L responsibilities in my career, I am not a CEO. Having mentored a few people and learned a few tips from the world’s best coach (Marshal Goldsmith), I decided to probe further. He was determined to get there and was willing to work hard. We discussed his winning formula, did a SWOT, and identified a few behaviours that needed attention. Defining the road ahead was easier than I thought; crafting the evolution plan took some time and then we agreed upon a follow up plan and progress report. I felt humbled by the experience, his faith in my words and suggestions on his actions which he ardently believed will get him to his goal. Reflecting on what my virtual guru referred to “I don’t coach losers because they are not willing to change”, I too believed in his plan and hope as he was willing to change. I believe sooner or later he will get there. And then last week someone asked me the question, “when will we see you as a CEO ?”, I started wondering if I should be reading more into these questions and discussions ! Flattery is good, but it should not be taken to heart lest the fall hurt the inflated ego !